As with the country as a whole, the 2016 presidential election has divided the Becker family. 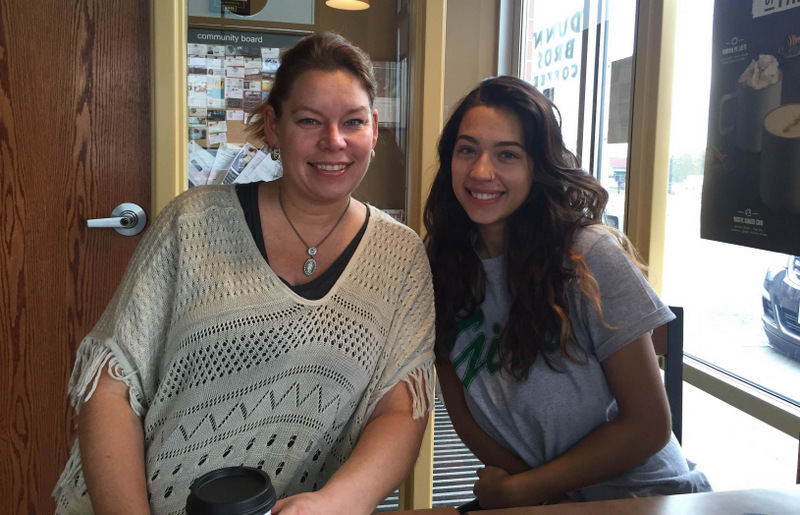 Gabbie, an East senior, has reservations but prefers Hillary Clinton, while her mom, Paula, a West Bend real estate agent, plans to vote for Donald Trump. “I’m very conservative, leaning libertarian on some issues,” Paula said. In fact, Paula has a track record of being very involved in local conservative initiatives. For the last seven years, she has been a member of the grassroots organization Common Sense Citizens of Washington County, serving for a time as president. Gabbie’s most recent participation in a political event was a protest at Donald Trump’s rally in West Bend on Aug. 16. Gabbie Becker protests Donald Trump’s visit to West Bend on Aug. 16. Photograph courtesy of Becker. “It was organized by the Washington County Democratic Office. 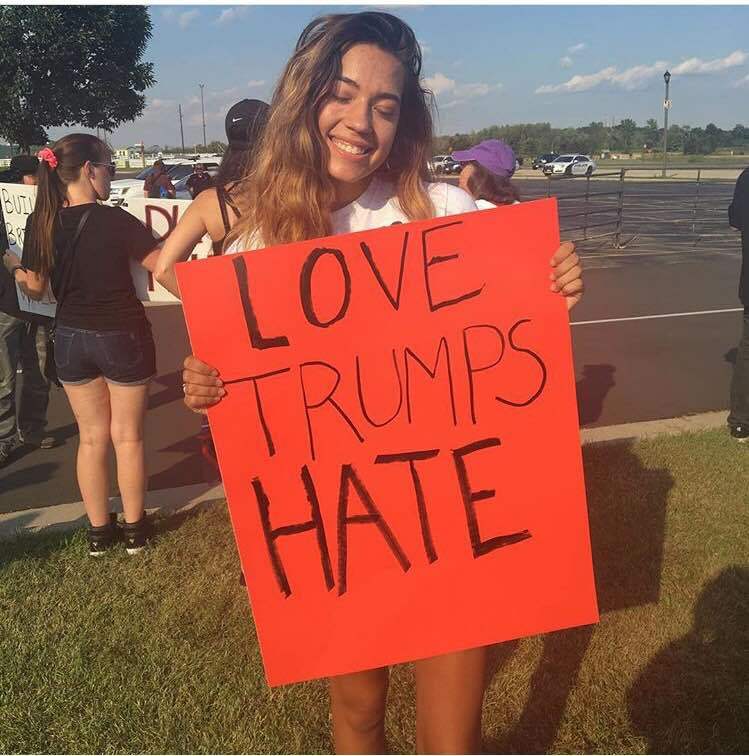 We just stood outside the Trump rally and peacefully protested,” Gabbie said. “While [Gabbie] was outside protesting the rally, I was inside supporting,” Paula said. The mother and daughter definitely have differing political ideologies, and it can lead to spirited conversation at home. “We have friendly debates and we discuss our views and opinions on things, but sometimes it does get sort of emotional and it can strike a nerve,” Gabbie said. One way they get along at home is by showing mutual respect for each other’s convictions. Gabbie believes the liberal agenda exists to fix injustices in America that create oppression and discrimination. She emphasizes equal rights for all human beings. “I lean more liberal, although I don’t like to use labels,” Gabbie said. Paula, on the other hand, supports a smaller government with fewer regulations, strong borders, and personal freedoms. She has always tried to instill those values in her daughter. Ironically, the reverse was true for Paula. She grew up in a Democratic household, and did not define herself as Republican until her mid-20s. “When I began my real life, where I got my first real paying career, began paying taxes, and got married, and had all the responsibilities of an adult, I just realized that my views fit better with the views of the conservatives,” Paula said. Mark Drake, a West High School social studies teacher, says that while opposing views within a family are not necessarily common, they do happen. One thing the Beckers agree on is that this year’s presidential election is not normal. “Watching the presidential debates, we do get to comment on the flaws of both candidates,” Gabbie said. In regards to the current election, Paula is disappointed that this is the first election process that Gabbie can be more involved in, though she is not yet able to vote. “Honestly, both candidates are creating divisions between families and friendships,” Paula said. “This election is definitely not ideal,” Gabbie said. Image courtesy of Common Sense Citizens of Washington County. What you’ve written about happens in many households. Singular events or candidates can change a person’s viewpoints, or energize them to participate. We’re seeing this happening with the two major party candidates. I appreciate the passion exhibited by the subjects of your piece. The important lesson here is to continue those conversations that will hopefully lead to positive changes in our homes, communities and country. Let’s focus on finding solutions to the issues instead of launching personal attacks against those with whom we disagree. Easier said than done, I know. Our democracy requires faith in the people to make the right choices, but it also requires healthy skepticism of our government institutions and leaders. Your direct actions – through voting, writing letters, joining parties, donating money or protesting – are important ways to hold our officials accountable to the people. I am glad to know people can have different views and still live peacefully AND respectfully together.